Basic biblical guidelines for recognizing if a curse is at work in your life, then getting out from under it and living under God\u2019s blessing. - Publisher Are you continually frustrated by sickness, financial pressure, strained relationships? Or perhaps accidents happen to you or your family with perplexing regularity. Do you wonder why some people seem to get more than their share of success and fulfillment? 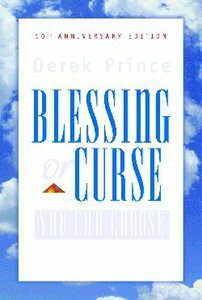 Derek Prince suggests that two forces are at work in every life: blessings and curses. One is beneficial, the other harmful. To enjoy the benefits of God's blessings and be protected from curses, we need to understand how these forces work. Prince shows dramatically that a curse is not a superstition from the Dark Ages. He draws on real-life experiences of people who were astonished to discover that they were not the victims of blind chance - or even of heredity. Rather, the problem was a curse that might have originated in a previous generation. Most imporant, Prince shows you how to recognize a curse at work in your life and helps you find release and God's blessings. Over 200,000 readers have found biblical understanding in "Blessing or Curse." Now this special tenth anniversary edition adds a new introduction by the author and a chapter-by-chapter study guide. About "Blessing Or Curse, 2nd Edition"
Are you continually frustrated by sickness, financial pressure, strained relationships? Or perhaps accidents happen to you or your family with perplexing regularity. Do you wonder why some people seem to get more than their share of success and fulfillment? Derek Prince suggests that two forces are at work in every life: blessings and curses. One is beneficial, the other harmful. To enjoy the benefits of God's blessings and be protected from curses, we need to understand how these forces work. Prince shows dramatically that a curse is not a superstition from the Dark Ages. He draws on real-life experiences of people who were astonished to discover that they were not the victims of blind chance - or even of heredity. Rather, the problem was a curse that might have originated in a previous generation. Most imporant, Prince shows you how to recognize a curse at work in your life and helps you find release and God's blessings. Over 200,000 readers have found biblical understanding in "Blessing or Curse." Now this special tenth anniversary edition adds a new introduction by the author and a chapter-by-chapter study guide.